What Is the Nutritional Difference Between White & Black Chia Seeds? All colors of chia seed have similar nutritional value. Although tiny, these seeds from the Salvia hispanica plant pack such a nutritional punch that nutritionists call chia a superfood. With protein content of up to 25 percent and dietary fiber reaching 30 percent, mature chia seeds of all colors are a wholesome addition to breads, cereals and drinks. Chia also contains significant amounts of omega-3 fatty acids, vitamins, minerals and antioxidants. Longtime chia seed researcher and University of Arizona Professor Emeritus Wayne Coates says there is "no major difference" nutritionally between different colors of chia seeds. He adds that any minor differences in food value from one batch of seed to another would depend on where the plants were grown. 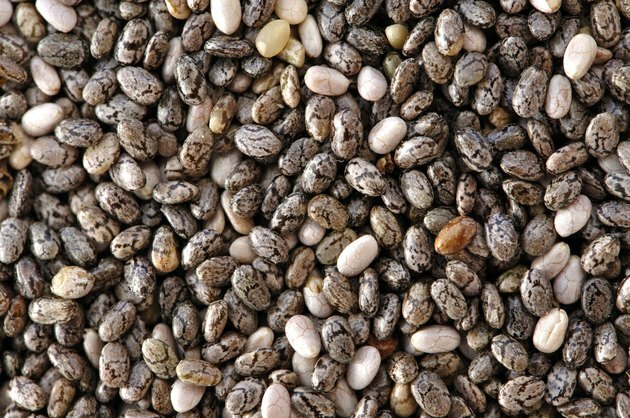 Coates notes that mature chia seeds are black, white, cream or gray. Other colors indicate either immature chia or weed seed. In her book "Superfoods for Life: Chia," Lauri Boone says that choice of seed color is only important aesthetically. Some foods may look better when prepared with light, rather than dark, chia seeds. Journal of Biomedicine and Biotechnology: The Promising Future of Chia, Salvia Hispanica L.